Grow Sunflower: Four Great Reasons for Growing Sunflowers! Who really needs a reason to grow sunflower? I have such fond memories of sunflowers from visiting family as a child in North Dakota. One day my great uncle put us up on the barn roof to look out over the fields. In that part of the state, sunflowers (Helianthus annuus) are a big crop and as far as I could see in any direction were the tall stalks and yellow discs of this sunny, yellow flower. I had never before seen the plant as anything other than a decoration. The notion that the sunflower was a “crop” was new to me. Of course, most people who grow sunflowers in a large area are growing them with a mind to harvest the seeds. Sunflower seeds or sunflower oil are a big deal and how cool is it to grow a valuable crop that brings you such joy while it grows?! 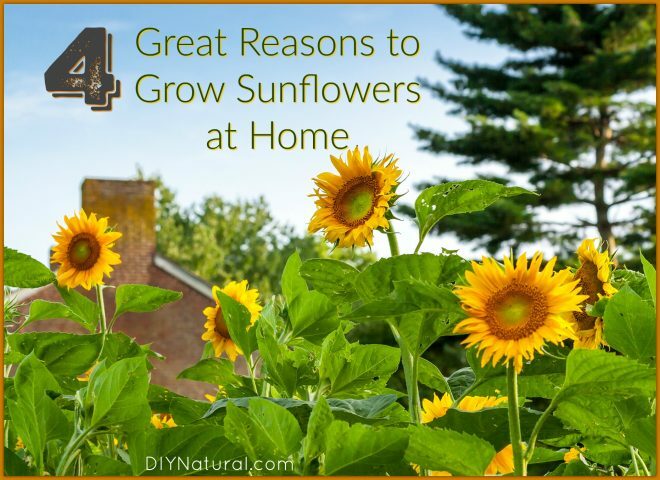 Did you know that there are many other reasons to grow the sunflower though? Here are some of the reasons you may want to grow sunflowers in your yard. Sunflower petals are increasingly in demand in the herbal industry. They may be a beautiful addition to a tea blend and can be used in much the same ways as the seeds. Sunflowers are good for your soil! The tall stalks stand strong with the help of the root system below. That root system, when allowed to die in place, increases the organic content of your soil and also increases its water holding capacity. Over time, growing sunflowers can increase your garden’s ability to withstand drought conditions. Last year we sowed a big patch of ground near our driveway with sunflowers. We used a two-wheeled seeder that we normally would use for corn or beans in the garden. The sunflowers came up and created a living wall that the kids loved to disappear into. It was a bright and cheery welcome home and I knew that this year when I was ready to plant lavender, the soil would be in great condition. While the birds were free to pick over these plants all winter, inevitably they missed a few here and there. We’ll have volunteer sunflowers for years to come and I know that I can use them for more than just the birds! I love sunflowers! They work well for weed suppression in the garden too. I haven’t had to plant them for years, as they come up on their own. It is fun to watch the finches hanging off the flowers to get the seeds.